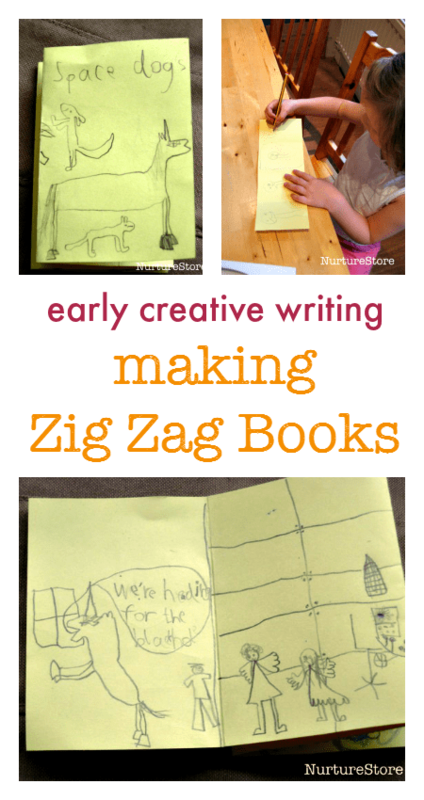 If you’re looking for a fun idea to get your child writing, try making a Zig Zag Book. 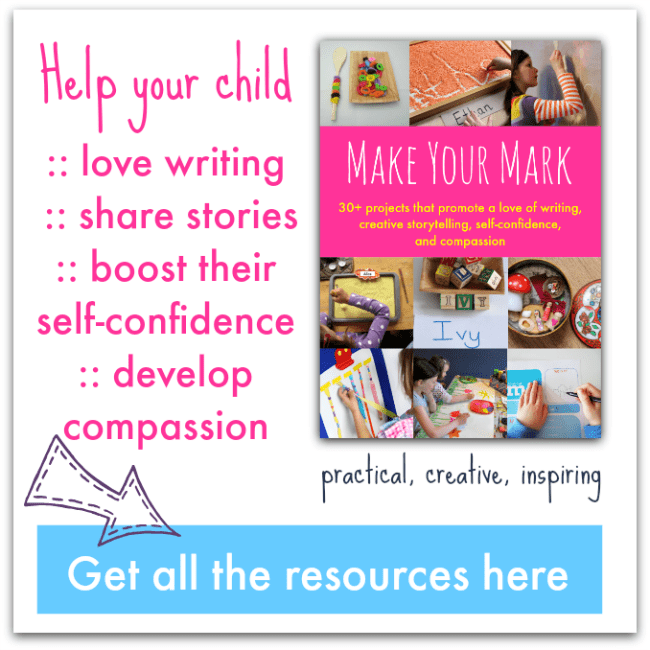 It’s a great way to encourage beginners to have a go at writing. The format of the book is fun and quirky and lets them do lots of drawings, adding in a little writing too. 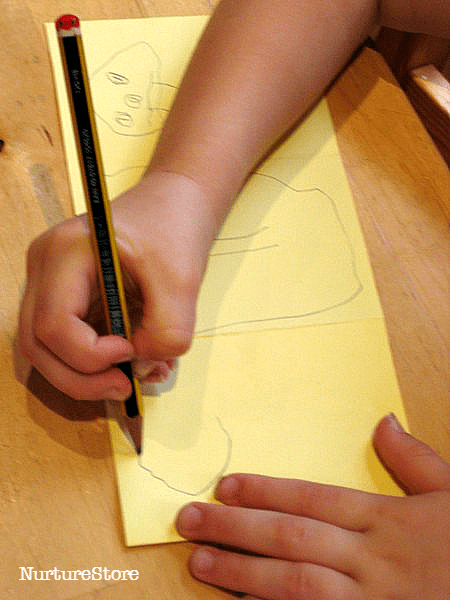 To make a zigzag book, take a piece of card (a long and narrow shape) in your child’s favourite colour. Fold it in half, then in half again to create a little book with four zig zag pages. Then it’s over to your child. What story could they write? They might like to make up a story from their imagination, or re-tell a story they know well. The format of the book, with its sequence of just four pages, encourages them to think about the structure of a story and come up with a start, middle and end to their tale. 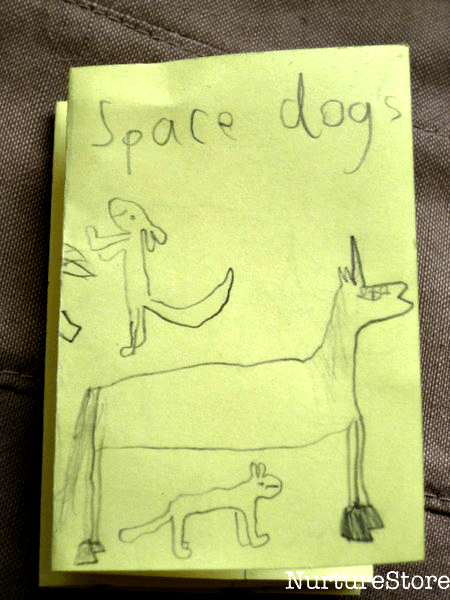 My younger daughter re-interpreted The Bog Baby , one of our current favourite reads, and her sister went for an alien adventure called ‘Space Dogs’. You can adapt the story writing to suit your child, making this a good activity for a group of children of different ages or abilities. 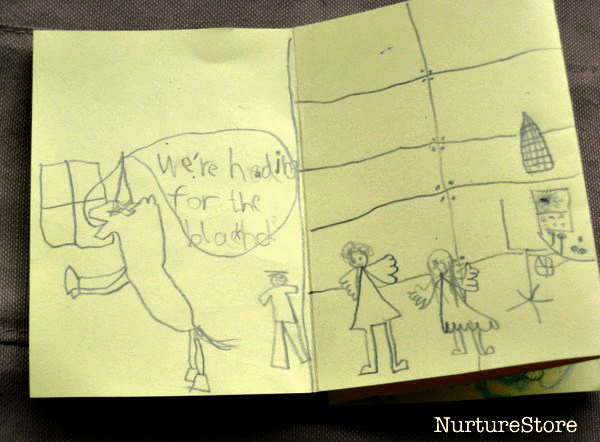 L (4yrs) did all her illustrations and then dictated her story for me to write. Making your very own book gives a great sense of accomplishment, and using this small size of zigzag book makes it possible for even very beginner writers to achieve this. B (7yrs) made hers all by herself – I suggested she just write speech bubbles for her characters, so she could include some writing without being overwhelmed by having to write full sentences. It’s so fun to see what their creative little minds come up with! I have a hard time keeping up with my daughter as she dictates and I write…we’ll definitely be trying this. Thanks! Great, Hannah! I’d love to hear what stories he comes up with.